Statistical analysis of mini-spiral galaxies shows an unexpected interaction between dark matter and ordinary matter. According to a study recently published in Monthly Notices of the Royal Astronomical Society, where the relationship is obvious and cannot be explained in a trivial way within the context of the Standard Model, these objects may serve as “portals” to a completely new form of physics which can explain phenomena like matter and dark energy. They resemble a spiral galaxy like ours, only ten thousand times smaller: the mini-spiral galaxies studied by Professor Paolo Salucci of the International School for Advanced Studies (SISSA) in Trieste, and Ekaterina Karukes, may prove to be “the portal that leads us to a whole new physics, going beyond the standard model of particles to explain matter and dark energy,” says Salucci. It is the first time these elements have been studied statistically, a method that can erase the “individual” variability of each object, thus revealing the general characteristics of the class. The video above captured by ESO’s OmegaCAM on the VLT Survey Telescope, shows the lonely galaxy known as Wolf-Lundmark-Melotte, or WLM for short, that lies in the rather faint constellation of Cetus (The Sea Monster). Although considered part of our Local Group of dozens of galaxies, WLM stands alone at the group’s outer edges as one of its most remote members. 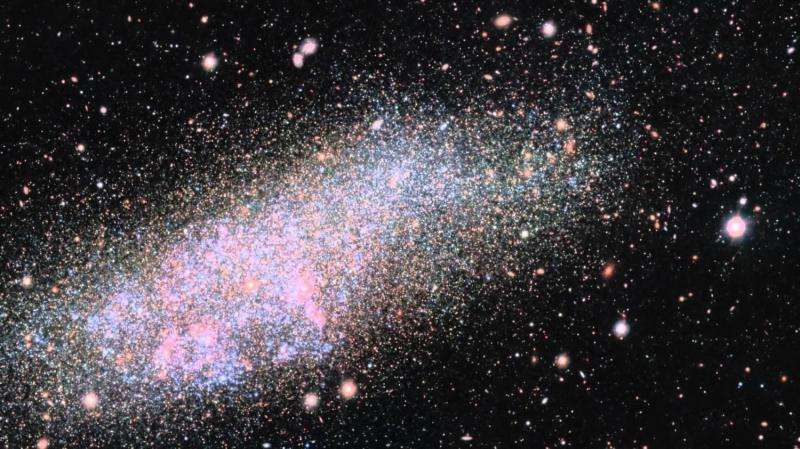 In fact, the galaxy is so small and secluded that it may never have interacted with any other Local Group galaxy — or perhaps even any other galaxy in the history of the Universe. Dark matter is one of the great mysteries of physics: since it does not emit electromagnetic radiation we cannot see it, even with the most sophisticated instruments. It was only discovered through its gravitational effects. Many believe it makes up 90% of our Universe. “It is a very strong effect that cannot be explained trivially using the Standard Model of particles.” The Standard Model is the most widely-accepted theory of physics in the scientific community. It explains fundamental forces (and particles of matter), however it contains some doubtful points, most notably the fact that it does not include gravitational force. Phenomena such as the existence of dark matter and dark energy make it clear to scientists that there is another sort of physics yet to be discovered and explored.